Welcome to the OAVT Public Health Rabies Response Program (RRP) Public Portal! Rabies is a viral disease, that affects the brain and central nervous system, and can be spread to mammals (including people and animals- both wild and domestic) through contact with saliva or nerve tissues from an infected animal. The most common way rabies virus is transmitted is through a bite or scratch from a rabid animal. Rabies can also be spread when infected saliva or nerve tissue comes in contact with an open wound or is introduced into a mucous membrane like the eyes, nose or mouth. The main animals that transmit rabies in Ontario include: bats, skunks, raccoons and foxes. For more information about rabies in Ontario please visit our Rabies Resources webpage. Although rabies was occasionally detected in bats in recent years in Ontario, Canada everything changed in December 2015 when raccoon strain rabies was detected in the Hamilton ON area. This was the first time raccoon strain rabies was detected in Ontario in 10 years and the first time ever to be seen in the Hamilton area. Since then an outbreak of the disease has occurred affecting mostly raccoons and skunks but has also involved other species including fox, cat and llama. The raccoon strain outbreak has also spread to other areas in Ontario including Niagara, Brantford, Haldimand-Norfolk and Halton. With over 400+ positive cases seen in Ontario since the outbreak began it is apparent that "Rabies Is Real!" For more information on the developing rabies outbreak in the Hamilton, Ontario area click here. Around the same time in December 2015 fox strain rabies was also detected in a cow in the Perth ON area. Since then a small pocket has developed in Ontario in the Perth, Huron and Waterloo and Wellington- Dufferin Guelph areas with presently 20 positive cases detected which have involved other species including skunk and fox. For more information about rabies statistics in Ontario, Canada click here. 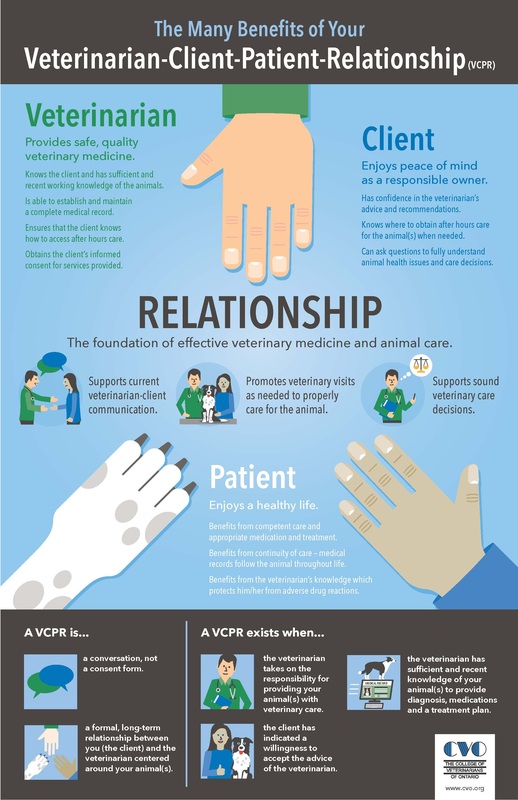 To learn more about vaccinating your animals for rabies, or to determine what you should do if your pet has come into contact with another animal that may have rabies, contact your veterinary healthcare team. If you do not currently have a regular veterinarian, and would like to find one in your area, to book an appointment with please click here. If you would prefer to speak with a telehealth veterinarian by phone please click here. What is being done in Ontario to Control Rabies? Ontario is well complimented by three government Ministries that work together in the fight against rabies including the Ministry of Health and Long Term Care (MOHLTC), Ontario Ministry of Food, Agriculture and Rural Affairs (OMAFRA) and the Ontario Ministry of Natural Resources and Forestry (OMNRF). The MOHLTC works with public health when a person has potentially been exposed to a rabid animal. Cases of potential exposure are investigated by local public health staff who determine the requirements for animal rabies testing and quarantine as well as post exposure vaccinations for people. The OMAFRA works with cases where animals have been potentially exposed to rabid animals. Working with veterinarians, cases of potential exposure are investigated and a determination is made regarding the requirements for rabies testing, precautionary confinement and post exposure vaccinations for animals. The OMNRF works with Ontario's wildlife population providing rabies surveillance testing and wildlife rabies vaccine bait distribution in areas where rabies has been known to occur. World Rabies Day is recognized every year on September 28th as a global day of action for rabies awareness and prevention and was created by the Global Alliance for Rabies Control (GARC). It is the anniversary of the death of Louis Pasteur, who developed the first rabies vaccine and laid the foundations of rabies prevention. Each year hundreds of thousands of people organize or participate in events to celebrate rabies prevention efforts and unite against rabies. Whether you’re a veterinarian, a medical professional, a teacher, or even someone who just cares about your community, it is a chance to organize or take part in an event that raises awareness about rabies and its prevention. It is the first and only global advocacy, education, and awareness campaign for rabies. It has the support of all international health organizations and major stakeholders including the WHO, OIE, FAO and CDC. Have you or your pet come in contact with an animal that potentially has rabies? Have you seen a wild animal that looks like it may have rabies? Please consult the following infographic to determine who to call when. Need to find the phone number for your local Public Health Unit? Click here for a listing of Public Health Unit contacts. What is the OAVT RRP? The Ontario Association of Veterinary Technicians Public Health Rabies Response program (OAVT RRP) is a program managed and coordinated by OAVT RRP staff in joint partnership with the Ministry of Health and Long Term Care (MOHLTC). The OAVT RRP provides the service of specimen collection and shipping to the federal Canadian Food Inspection Agency (CFIA) laboratories for rabies testing. These specimens are from cases involving potential human exposure to rabies caused by animals. This much-needed rabies surveillance program utilizes the skills of Registered Veterinary Technicians (RVTs) in the process of specimen collection and shipping throughout the Public Health Unit (PHU) regions across the Province of Ontario. Animal specimens tested include wildlife, livestock, companion animals and zoo animals. Rabies vaccinations help to keep both animals and people safe from rabies. In Ontario, rabies vaccination clinics are accredited by the College of Veterinarians of Ontario and supervised by licensed veterinarians. To find a listing of rabies vaccine clinics in Ontario please click here.